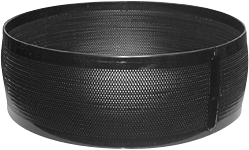 When using self-cleaning strainers on wet well inlets an additional amount of drawdown can be incurred. While not detrimental in itself, this variation should be considered when designing the wet well and or when placing the various low level switches and indicators. The following formula and chart may be used as approximate values for this additional drawdown. Other factors, such as elevation and barometric conditions will also effect this value.